In the beginning of February, I challenged myself to post at least 10 times a day on Twitter. As I explained in the blog entry announcing the challenge, I had a variety of reasons for undertaking it. Mainly, though, I wanted to make better use of my Twitter account. Now that the month is done, how did I do? And what, if anything, have I learned? Unlike my previous challenge to publish one blog post a day in November, I didn’t quite achieve my goal this time. The main reason for my shortfall was a vacation in San Antonio, Texas. As the accompanying chart shows, I fell short of 10 tweets for all 5 days of the vacation. On one lamentable day, I managed only one tweet. 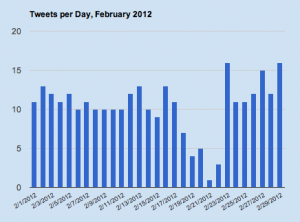 Overall, I sent out 301 tweets, for an average of 10.4 a day. Humble though that number may appear, it is 10 times my daily average for the previous six months. My aim was not just to tweet 10 times a day, but to make about one-third of the tweets promotional (linking to something I’d written), one-third curatorial (linking to something elsewhere on the web), and one-third conversational (where there is no link, just a comment). Despite having just self-published a book (the New-Media Survival Guide), my usual reticence restricted my promotional tweets to just 12% of the total for the month. Conversationally, I was closer to my target, at 24%. More than 6 of 10 tweets was curatorial. A couple of other metrics are worth noting. 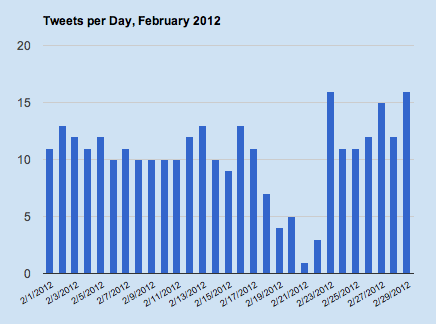 My lifetime average for daily tweets, as determined by How Often Do You Tweet?, has risen from 0.7 to 0.9. And my net number of followers has increased by 28, to 283. Though I can’t say for sure whether my stepped-up activity is responsible for the increase in followers, I gained 45 in February compared with 29 the month before. Midway through the month, I noted a few of the things I’ve learned about Twitter and myself in the course of this challenge. I would add a couple more. First, I’ve found that tweeting about articles and other Web content is a good way to keep track of them. I don’t often remember to bookmark things I like. But since my Pinboard social bookmarking account records links in my tweets, I don’t have to remember to bookmark them if I’m tweeting actively. Second, both the quality and quantity of my tweets are related to those of the people I follow. On days when a lot of them were sharing great content, I didn’t have any difficulty meeting my quota. On other days, there wasn’t much worth retweeting or commenting on. Recognizing that this review of my challenge is of interest primarily to myself, I won’t draw it out. But as I noted two weeks ago, it’s been a good experience for me. Will I maintain my average of 10 tweets a day in the coming months? I can’t guarantee it. But I will try. Stay tuned. This entry was posted in Social Media and tagged content, conversation, Social Media, Twitter by John Bethune. Bookmark the permalink.